The way we position our bodies dramatically influences -- and is influenced by -- our subconscious. This article has a lot of really interesting applications in psychotherapy of the body influencing the mind! Fascinating. The way you describe navigating the world based on people's expressions is similar to how Joe Navarro described his experience. He immigrated to America when a youth and knew no English at the time, forcing him to rely on reading body language to understand what was going on. He went on to be an FBI interrogator and used the skills he developed in reading body language in evaluating the truthfulness of those he questioned. 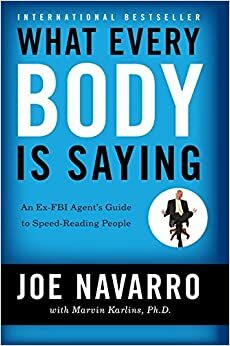 Navarro wrote a book called "What Every Body is Saying". In it he identifies a number of universal body language patterns and sets out guides for interpreting what they mean based on context. I failed a job interview recently where the interviewer seemed much less comfortable than me with eye contact. He was fidgeting constantly and only briefly looking into my eyes and then quickly looking away. On the other hand, I remained confident, composed and was perfectly comfortable maintaining eye contact. On paper, the interview went great and I had no problems with the whiteboard questions or any of the other questions. However, his body language was clearly not vibing with mine. He may have felt I came off too aggressive and overconfident. For the record, I did not think it was confrontational, in fact the conversation itself was pretty easy going and fun as far as technical interviews go. I've been thinking about it and trying to come up with a way of calibrating my body language in the moment to make the other person more at ease. If anyone has any suggestions on reading, I'd love to hear them. I've read that FBI agent's book  since then and found it a little bit helpful, but nothing earthshattering. The author is more concerned with cracking/breaking people than making them comfortable. Not sure if this entirely applies, but I really love this book. It's more to do with the body language of OTHER people. Lurker here, my time to chime in. While I won't profess to be someone like an interviewer in Human Resources, there is some truth to this list. In my line of work, I'm forced to meet new potential clients constantly, so I definitely had to educate myself on reading books like What Every BODY Is Saying. (disclaimer: I'm not plugging in for anyone other than a book that opened my eyes to some of the basic principals of body language). And to this sub, this can be quite an underrated skill. Something that isn't discussed enough in r/socialskills. Immense at times. The list could/should have been re-written to not sound quite as harsh in my opinion. If there's anything about body language, ignore this list's specific point and pay quick, but subtle attention to feet/legs. One key takeaway for example: if someone crosses their leg with you while standing and talking, that creates an imbalance for them, meaning they're comfortable with the other person. It taps into the fight/flight psychological response, which shows they're not quicker to dismiss you. It may sound stupid, but trust me, I've seen enough examples of this at a dealership, supermarket, mall, etc. Now watch how a cop speaks with their posture while standing at the side of the vehicle, their legs will be spread apart to exemplify an authoritative stance, no questioning there. We do this because we learned to lie with our faces and mouths while growing up, yet the bottom half of our bodies tell another story. Recall those times when you try to have an honest, open conversation with someone. Body language is very, very important then. Notice company across the table incessantly moving a foot up and down? They probably have a lot on their mind. One foot turned towards an certain direction while standing? They are ready to leave the conversation. While I can agree nothing on this list is 100% accurate, or even what I'm saying (I'm explaining it next), it can give you a one-up on certain individuals/moments in a conversation, and the other person doesn't even have to know. Sometimes they shouldn't know, because people don't like to be known they're being read. Over time when you interact with someone consistently, baseline behaviors become idiosyncratic, or particular to that person or group. This is where inconsistencies can occur. Lists like these can be off-putting, but please don't let it turn you away from refining/learning more about non-verbal communication.